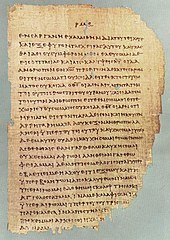 The Epistle tae the Romans or Letter tae the Romans, eften shortened tae Romans, is the saxt beuk in the New Testament. Biblical scholars gree that it wis composed bi the Apostle Paul tae explain that salvation is offered throu the gospel o Jesus Christ. This page wis last eeditit on 12 October 2018, at 19:37.